Weather forecasters say Michigan will likely hit record low temperatures this week. Most cities have advised that people stay off the roads completely, but unfortunately that's not an option for some. So if you must drive, be prepared! Stock your car with emergency supplies, both for you (first aid kit, winter clothes, blanket) and your car (jumper cables, spare tire). Be prepared to dig your car out of a snow bank by always having a shovel, sand or kitty litter, and a tow rope. And keep a flare handy. Make sure you have at least a half tank of gas before going anywhere. Temperatures in the middle of the week are going to be dangerous, and at some times you'll be susceptible to frostbite after just 15 minutes outside. Dress warmly. Your face and and hands are most likely to get frostbite, so make sure to keep those areas covered with warm, dry clothing. Know how to treat frostbite. The first sign of frostbite might be redness or pain on any area of skin. Be aware of hypothermia, and seek medical attention if anyone's temperature drops below 95 degrees Fahrenheit. Small pets like Seamus can only handle extreme temperatures for short periods of time. Keep your pets safe, too! 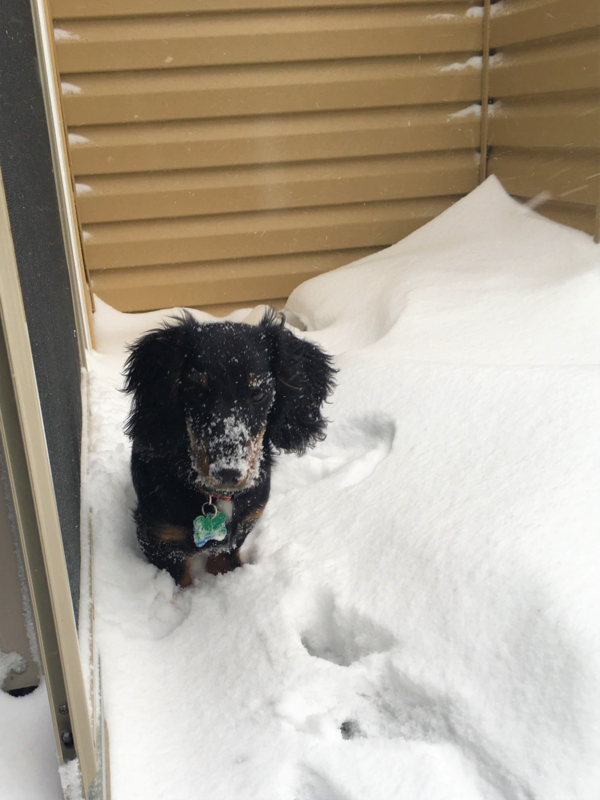 The snow might be fun for Fido to run through for a while, but dogs and cats can be affected by extreme winter weather as well. Limit time outside. Remember, if it's too cold for you, it's too cold for your pet! Dry your pets as soon as they get inside. Use booties or petroleum jelly to keep the salt and ice off your pup's paws. With up to 10 inches of snow expected in some areas, clearing snow is a necessity. But it's important to take precautions. Don't overexert yourself. Shoveling snow can be a real workout, so it should be treated like one. Work slowly and take breaks if needed. The American Heart Association warns that though shoveling may be safe for most people, the risk of a heart attack is something for some people to keep in mind. Make sure you replace the gas in your snowblower. With snow like this, it may be tempting to break out the snow blower and get right to it. But after a long spring, summer, and fall of that snowblower sitting in the garage, be sure to replace last winter's fuel. With wind chill advisories across most of Michigan, most of us will be experiencing temperatures close to -25 degrees Fahrenheit. While the temperature is expected to increase throughout the day, when it's windy and this cold, your body will start to lose heat faster than it can produce it. Some people who left gasoline in their snow blower last winter, and fired it up without refueling this winter, are finding out that was a mistake. Almost all gasoline sold in Michigan has 10% ethanol in it. That gas, called E-10, destabilizes after a month. So firing up a small engine with old gas can damage the engine.